This article follows on from Part 4 of “The Meaning of Life” series, in which the author talks about the art of straightness, forward momentum and thrust. Warning: If you believe that straightness can be achieved between the inside legs and the outside rein, or any other simplistic formula, do not read this article; you might experience shortness of breath, palpitations, high blood pressure, heart acceleration, fever, anxiety, depression and keyboard attack. The bullfinch combination was an interesting “question.” In the three-day-event, a bullfinch is a brush that can go as high as 6 feet or more. The game is not jumping over, but rather through. The brush is dense until about four feet and then becomes lighter, allowing the horse to jump through the branches. The combination was composed of two bullfinches separated by three short strides. Making it more interesting was the fact that the two bullfinches were not in a straight line. The second one was angled toward the right. A straight line would be possible jumping the first one at the extreme right and the second one at the extreme left. This was not a viable option as bushes and higher branches were quite thick toward the outside of the jump. The middle was definitely lighter. Coming in oblique has its own set of difficulties as the branches are easier to jump through going straight than approaching and jumping at an angle. For my horse, the three short strides were a problem. It is the same horse from the two previous stories and this was his first advanced-level competition. As you know, his favorite options were fast and faster and he did not like shortening the strides when cantering at speed. Another consideration was that he did not have the experience of this type of jump. Often, horses will try to clear the brush jump, leaping too high and consequently landing further away after the jump. I was confident that he was intelligent enough to jump through the branches; however, I anticipated a big jump and consequently an even shorter distance between the jumps. The visual impression was another consideration. The horse could see the second jump only while flying through the first one. Several horses had already run out at the second jump under these circumstances, and so I considered coming in a sharper angle, which would increase the distance between the two jumps. The benefit was more room for three normal strides. The risk was approaching the second jump on a sharper angle. “On the top of that,” commented the coach, “the angle is toward the right which is his difficult side.” I told him that we have made progress about his straightness but the coach cut me short. “Every horse makes progress but doing better is not having resolved the problem. My question is do you think that he is athletically straight enough to keep the line through this combination. 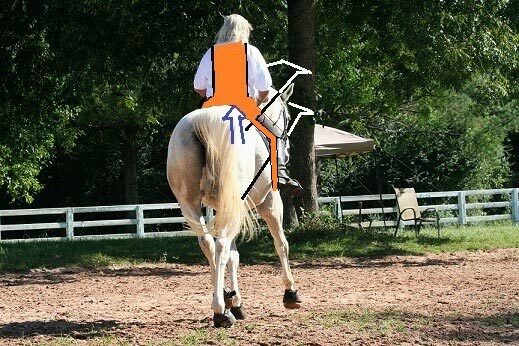 It is one thing to make the horse look straight in the dressage ring. It is another thing the stay straight in action.” I forced a strong yes out of my mouth but the thought in my mind was that I should have kept my mouth shut. What puzzled me during the combination was the feeling of straightness. All the energy was directed in one direction. The thought of “dynamic straightness” crossed my mind. We always talk about straightness thinking geometry, the shoulders in front of the haunches, the body straight. Gustave Steinbrecht straightened the horse between the inside leg and the outside rein. I remembered the Chinese proverb, “If you are standing upright, do not fear a crooked shadow.” My horse’s spine was a crooked shadow; I knew that I had not fully corrected his back muscle imbalance, but in action, when we were both concentrated on the performance, his energy was absolutely straight. I have no doubt that straightness was essentially a dynamic phenomenon, but nothing in the equestrian literature as well as in the scientific research truly addressed the concept. In its simplest form, straightness is about a horse travelling with the shoulders in front of the haunches. The thought is not incorrect but, placing the shoulders in front of the haunches is only visual straightness. A horse can be apparently straight, maintaining the shoulders in front of the haunches and travelling with a thoracolumbar spine totally crooked. On this picture of a severely crooked thoracolumbar spine, we draw a straight line from the wither to the haunches. If the horse travels in the direction of the red line, it would be visually straight but it would be biomechanically crooked. Another simple theory of straightness is a horse travelling with a thoracolumbar column perfectly straight as illustrated on the figure C. This is possible on a diagram, but this is not possible in motion. At the walk for instance, the right foreleg moves back, as illustrated in the graphic (A), and thoracic spine bends laterally to the right. In the thoracic vertebrae, lateral bending occurs between T9 and T16. Simultaneously the forward swing of the left hind leg is associated with left lateral bending of the lumbar vertebrae. In the lumbar vertebrae, there is a small capacity for lateral bending between L1 and L5. At the next sequence of the stride, the left front leg moves back, bending the thoracic spine to the left and the right hind leg swings forward, bending the lumbar vertebrae to the right, as illustrated in the picture (B). Basically, there is not a single moment of the stride where the thoracolumbar spine is straight. This of course applies to the trot and canter with different kinematics of the thoracolumbar column. We have voluntarily designed greater lateral bending on the figure (A) illustrating the fact that back muscles are never perfectly symmetrical and there is always a preferential lateroflexion. It is not necessary to the right as illustrated on this diagram but there is always muscular imbalance which, if not specifically addressed by the training approach, will be protected by the horse’s central nervous system. The horse will travel crooked and will have difficulties bending in one direction. As you know, lateral bending is always coupled with a movement of transversal rotation but in order to soundly comprehend the biomechanics of straightness it is easier to approach the problem, one force at the time. Straightness has nothing to do with stretching and relaxation. On the contrary, straightness is about forces acting on the thoracolumbar spine and how the muscular system of the equine back manages, reduces and redirect these forces. Dr. Betsy Uhl, DVN, PhD, Dip, ACVP, explained for the members of the course how forces were directed oblique from the limbs to the spinal column and how the muscles had to resist and redirect these forces. Emphasis was made on the intensity of the forces acting on the metameric structure of the vertebral column. Uhl pointed out the wear and tear visible on the articular facets of the vertebrae of two different skeletons. In motion, the thrust generated by one hind leg induces an oblique force on the spine. Without compensation of the muscles situated on the other side, the thrust generated by one hind leg would bend the lumbar vertebrae or move the croup sideways as illustrated by the drawing on the left. Instead, forward movement is created by the propulsive thrust of the hind legs, (red arrow), that is resisted, managed and redirected by the back muscles and in particular the muscles situated on the opposite side of the pushing hind, as illustrated on the drawing at left. Straightness is therefore how the muscular system of the thoracolumbar spine manages forces. Hind and front limbs induce forces on the thoracolumbar spine and the muscular system resists, diffuses or redirects these forces. For clarity, this model focuses only on lateral forces. The reality is more complex since there is also gravity pulling the spine down; upward forces resisting the attraction of gravity; transversal forces, which are pulling one side of the body down while the other side is supported by the limb on the ground; and the combination of all these forces. But the muscular system functions under the same principle; it resists, diffuses or redirects force. There is no room for stretching and relaxation. Locomotion and performance are not created, increasing the range of motion of the thoracolumbar spine. Instead, locomotion and performance is created through the subtle orchestration or numerous and minuscule contractions and compensatory contractions. The biomechanics of the vertebral column forms the basis of all body movements and when the thoracolumbar spine is not functioning in a proper line, there are inevitably repercussions on the kinematics of the hind and front limbs. This diagram illustrates a horse travelling with a thoracolumbar spine slightly bend to the left, (red lines). The black lines are there as a reference. Lateroflexion occurs in the vicinity of the 9th to 16th thoracic vertebrae but modifies the alignment of the whole spine. The lateroflexion of the thoracic vertebrae affects pelvic and shoulder placement in respect of the direction of the motion. The consequences are going to be the loading of the right foreleg and deviation of the croup to the left. This was exactly the situation of a Swedish warmblood named Dominique. Repetitive loading on the right foreleg created kinematics abnormalities inducing excessive stress between the distal sesamoid bone and the deep digital flexor tendon. Dominique developed navicular disease on the off side. We restored soundness, correcting the scoliosis of the thoracic spine. Basically, we restored soundness recreating straightness. The problem was aggravated by the fact that the lateroflexion of the thoracic spine was coupled with an inverted rotation, shifting the dorsal spine to the right. Normal rotation shifts the tip of the dorsal spine toward the inside of the bend. In case of inverted rotation, the tip of the dorsal spine is shifted toward the outside of the bend. In Dominique’s case, left lateral bending of the thoracic vertebrae was coupled with an inverted rotation, further aggravating the load on the right foreleg. Simplistic equitation suggests straightening the horse between the inside leg and the outside rein. In the case of this diagram, straightening the horse would be achieved between the left inside leg and the right outside rein. Such techniques would move the croup and the shoulders but would not have any effect on the lateral bending of the thoracic spine. In the next illustration, we push the shoulders toward the left with the right outside rein and contain the haunches with the left inside leg. We move the body but we have no effect on the lateral bending of the thoracic spine. Lateral bending as well as transversal rotation of the horse’s thoracic spine occurs between the rider’s upper thighs. It is more accurate to refer to the rider body including the upper thighs. Body alignment is a dynamic phenomenon that is better explained by the concept of a corridor. On the circle as well as on straight line, the rider’s body creates a corridor inside which the horse’s body moves. On the circle, the horse’s thoracolumbar spine is not evenly bent as it was believed in old theories. Bending occurs between T9 and T16, and transversal rotation occurs mostly between T9 and T14. Basically, lateral bending (red line) and transversal rotation (blue line) of the horse’s thoracolumbar spine occurs between the rider’s thighs. When the horse shifts the rider’s seat toward the outside of the circle, the rotation is inverted. Walking or trotting a horse on a small figure 8 helps in identifying the horse’s preferential rotation. On one circle, the horse shifts the dorsal spine further toward the outside than on the other circle. Identifying the horse’s preferential rotation is always interesting since straightness is about narrowing these rotations and therefore correcting the inverted one. The picture at right shows a spectacular example of right lateral bending coupled with an inverted rotation shifting the dorsal spine and the rider toward the outside of the bend. In fact, the rider compensates very well; if you look at his stirrups and then his body you can see how well he compensates for the torsion of the horse’s spine. Due to the spine torsion, the horse cannot lift the croup as normally required and it clears the jump, increasing the rotation of its thoracic spine and passing the hind legs sideways. Vertebral column dysfunctions are the main cause of limb kinematic abnormalities and consequent injuries. In this picture, the spine torsion redirects the load on the left front leg, inducing intense stress at the landing. At the walk and trot, the equine thoracolumbar spine bends alternatively right and left in synchronization with the limb movements. Straightness is therefore not about a thoracolumbar column remaining straight but instead, straightness is about a reduction of the lateroflexion and control of transversal rotations allowing the horse to travel in a narrow corridor. At first, lateral bending and transversal rotations displace the shoulders toward the left and the croup toward the right as illustrated in this diagram. The corridor is then wide. It can be the opposite, the shoulders shifting to the right and the haunches to the left. Sometimes the feeling is the shoulders and haunches shifting in the same direction. The horse is bouncing from the right wall to the left wall of the corridor. As symmetry and proper coordination of the back muscles is progressing, the amplitude of the lateroflexion reduces and the transversal rotation remain closer to their higher point, which is the middle and the horse travels more straight, within the limits of a narrower corridor. There is no formula for straightness for the very simple reason that each horse commences its education with its own morphology and muscle imbalance. The proverb applies to straightness. Guiding the horse’s brain and body on how to direct all the forces in a straightforward direction demands knowing about the forces acting on the thoracolumbar spine and how the muscular system manages these forces. Truly, straightness, balance control, forwardness, suppleness, easiness, calmness and efficiency, are one and the same. Transversal rotations have a considerable influence on straightness. They are created by the way the vertebrae articulate with each other and the attraction of gravity. Old theories followed that lateral bending placed the inside side of the vertebrae in contact with each other while separating the outside. (On the above diagram, from Richard Tucker, the vertebrae are illustrated as rectangles). Old theories also believed that lateral bending was even all along the thoracolumbar column. More advanced knowledge exposes a totally different mechanism. The front part of a vertebra is shaped like half a tennis ball while the back of the previous vertebra shows a concavity matching the convexity of the following vertebrae. Vertebrae rotate around each other. During flexion, for instance, the rotation occurs as illustrated by the red arrow and the dorsal spines separate from each other. During extension, the rotation goes the other way and dorsal spine becomes closer. (This diagram is by Jean Marie Denoix. We just added the red arrow.) However, the reality is three dimensional as the vertebrae also rotate for lateral bending as well as transversal rotations. Watching the Eadweard Muybridge picture series, we can visualize Tucker’s observation. On the left picture, the left front leg is on the ground supporting the left side of the horse’s body. The right front limb is now off the ground in the swing phase. Gravity pulls the right side of the body downward as illustrated by the red arrow. This is referred to as “passive rotation.” If not corrected, such passive rotation would hamper the forward movement of the right front limb. The passive rotation is therefore immediately converted by the muscular system of the forelegs, as well as the back muscles, into an active rotation turning the thoracic spine in the opposite direction. This diagram, created by Jean Marie Denoix, DVM, PhD, illustrates a left lateral bending coupled with a rotation shifting the dorsal spines to the left. This rotation, which is the correct rotation, is referred to as right rotation since the ventral part of the vertebral bodies is facing right. As the left front leg moves back, the thoracic spine bends laterally to the left and the rotation shifts the dorsal spine toward the left. This is named right rotation as the scientific world names the rotation by the direction faced by the ventral part of the vertebral bodies. When the dorsal spinous processes turn left, giving to the rider the feeling of left rotation, the scientific world defines the rotation as right rotation. This is a little confusing and this is why we talk about the direction of the dorsal spine. Even if they have been comprehensively explained in 1999, transversal rotations have always been there. Classic authors interpreted and explained them differently. The expression dropping the shoulder for instance is simply the feeling given by an uneven rotation of the thoracic spine. Transversal rotations are going up and down, down left, up middle, down right, up middle, down left, up middle and so on. Mild muscle imbalance will induce greater rotation on one side. More severe back muscles imbalance will accentuate the rotation in one side giving the feeling that the horse drops the shoulder. Straightness, which is balance, forwardness, suppleness, easiness, calmness and efficiency, demands reducing the rotation and keeping them as close as possible to the higher holding of the trunk between the forelegs, the middle. In order to do so, the rider needs to realize that he or she is the corridor. Riding is pure physics, interaction of forces and consequent actions. In this picture, the horse is at trot. The left diagonal on the stance, the right diagonal is on the swing. The propulsive force of the right hind leg is acting on my spine in the direction of the blue arrow. If I absorb this force, bending my vertebral column laterally (yellow line), the thrust generated by the horse’s right hind leg, aggravated by the lateral bending of my vertebral column, would move the horse sideways, thus loading the left foreleg (yellow arrow). Instead, if I reduce the lateral movements of my spine, I create a corridor channeling the horse’s forces in a straight forward direction. The upper thighs are truly the parts of the rider body enveloping the horse’s thoracic spine. The corridor needs therefore to include the back, the pelvis and the upper thighs. The calves control the hind legs, continuing the corridor created by the rider’s body. Narrowing the corridor does not mean squeezing the horse between the calves and the upper thighs. Narrowing the corridor does not mean squeezing the horse between the calves and the upper thighs. It means feeling and controlling in the calves the eventual deviation of the croup and feeling and controlling in the upper thighs, the pelvis and the back, the eventual deviations of the horse’s shoulders. Straightness, balance, forwardness, suppleness, easiness, calmness and efficiency, are one and the same. General Lhotte magisterially summarized the concept in three words, Forward, Straight and Calm. The calmness suggested by General Lhotte is not the one gained through poor nutrition and/or drugs. Calmness in action is the serenity and confidence of an athlete properly developed and coordinated for the athletic demand of the performance. This article is the abstract of a more complete study that will be Jean Luc’s presentation during the 2015 Science of Motion International Conference. As always, the International Conference combines discussions about advanced research studies and in the training ring, the practical application of new knowledge both in hand and under the saddle. ← Do horses really enjoy jumping? A true bullfinch as described should never be used in a combination: preferably at all and certainly not as other than the final part. Due to its nature, it is impossible to predict the height and trajectory at which a horse will penetrate it and thus set itself up for the required stride pattern from an unpredictable landing point . A horse will not be able to focus through an earlier element and interpret the question posed by obstacle, until it is too late. Identifying, and thus giving, the correct answer will be entirely a matter of chance and not skill on behalf of the horse and the rider. This is intrinsically unfair and dangerous. Make no mistake, a combinaion of bullfinches is not at all the same situation compared to angled hedges when say a brushable ‘fringe’, within the permissable sillouette dimensions, is a safety measure that forgives some degree of error in clearing the top line. The debate in this second case is “When does the percentage of use of fringes throughout a course become excessive and constitute teaching a horse to jump carelessly?” It is a question of balance which also happens to be the one-word summary of General L’Hotte’s classic three! Hi Jean-Luc, I am not at all saying you did not have a good plan and that it worked out for you. That was excellent and your technical explanations are outstanding. Most competitors would not be able, or bother(!) to rationalise to anything like that degree. I would be worried if anyone thought they might construct such a test to practice at home, or anywhere else!. You described the fence and the problem clearly. What I am saying is that in principle to have a related fence after a bullfinch, especially a second bullfinch, is dangerous because being sure to be able to achieve the desired solution and for the horse to understand what is required, is way too unpredictable in this situation. My criticism is directed at the obstacle design, and not at all at your solution. You did point out that it had been drawing a high rate of faults. Your solution was 100% correct. I am concerned that the possibility is too high that the horse could be tricked by the question. If you believe that it is safe to have a horse trained to go cross-country being utterly dependent on the rider for instructions, then I would be horrified! Btw, the serpent fence at Lexington 1978 was the object lesson in the plough-share (plow-blade?) lateral rotation effect of contact with an angled rail, especially where horses are likely to drag legs onto a fence into water.